How does asphalt keep up with the freeze-thaw weather of Minnesota? Sealcoating does a lot of the work. 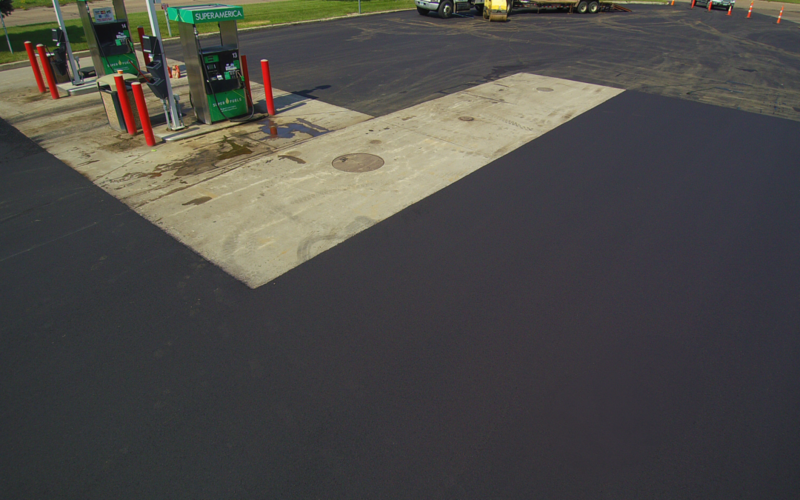 When expertly applied, it helps protect your asphalt from any outside source of damage, whether it be heavy vehicles, chemicals, or weather. Even when patching, a finishing sealant helps prevent the cracks or damage from occurring again. Simply repeat the process every two to three years after the initial sealcoating, and your lot will be set. Additionally, your company’s pavement is one of the first things your cliental see, so it’s important that it looks well-kept. Sealcoating and keeping up with your parking lot’s needs help increase the life of your pavement while also avoiding car-damaging potholes and large puddles. By keeping moisture out of the asphalt, which is especially important during the in-between seasons, you will save money over time. Sealcoating your pavement is especially important before winter sets in. Having an extra protective layer will help your pavement stand up to the freezing temps and weight of plows driving around every time it snows. It also helps protect your pavement from being broken down by deicing chemicals, resulting in better looking and more durable pavement come springtime. If you’re worried your parking lot isn’t ready for winter, call Metro Paving today for a consultation.